Apple iPhone 6 is just a few weeks away, but that shouldn’t stop the rumor mill from leaking every single bit of information it can. We’ve see leaked schematics, dummy units and what not, revealing what we can expect from the upcoming iPhone 6. However, the latest leak is more interesting then the ones we’ve seen in the past, since it comes from one of the suppliers of the Cupertino company — Foxconn. The latest leaks reveals the schematics and dimensions of the alleged iPhone 6, showing us how thin the device would really be. 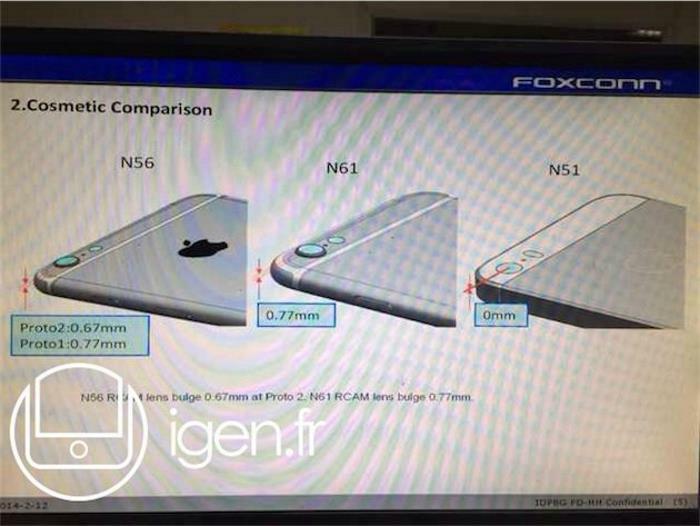 As seen in the image above, there are three iOS devices, but one of them is the good old iPhone 5S carry a codename N51 and measures 123.83 x 57.5 x 7.6mm and weighs only 112g. Here comes the interesting part: the device N61 is believed to be the 4.7-inch iPhone 6 — can be rounded off based on the schematics shown as well. 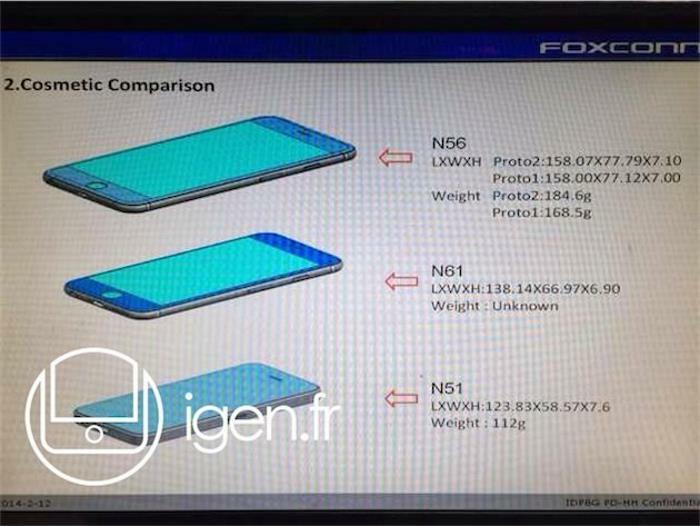 The image shows the alleged 4.7-inch iPhone 6 will measure 138.14 x 66.97 x 6.90 mm. The device appears to be considerably taller, wider and thinner, but there’s no word about how heavy it would be. Last but not the least, there’s another device codenamed N56 which is the 5.5-inch model. If the images are legit, it seems they are testing two prototypes of the 5.5-inch iPhone 6, with a slightly different dimensions and weight. The prototype 1 measures 158 x 77.12 x 7.0 mm and weights 168.5g, while the second one is just a tad bigger measuring 158.07 x 77.79 x 7.10 and measures 184.6g. Another interesting thing to note here is the protruding camera in both variants of the iPhone 6 (as seen above). We’ve heard a number of times that iPhone 6 will have a protruding camera because the purported device is very thin, and its a little difficult to find a camera module which can fit in it. Apple is expected to launch the new iPhone 6 on September 9th, but there’s no confirmation from Apple about the event at the moment. We’ll update you as soon as more information comes up.